Preservation New Jersey and the New Jersey Jazz Society are pleased to welcome award-winning composer/lyricist pianist/singer Sue Maskaleris back to the 1867 Sanctuary. She will share the bill with Jeff Raheb, a guitarist, vocalist, and composer for whom she has written lyrics, and his prodigy son Julian Raheb, an accomplished 13 year old composer and pianist. The concert will feature collaborations by Sue and Jeff, father and son, and four-hand piano music with some Halloween treats! Pianist, singer, composer, lyricist, arranger and producer Sue Maskaleris grew up in Short Hills, NJ. She studied composition at Manhattan School of Music with John Corigliano. Sue played solo and led groups in NYC for 35 years and also abroad. 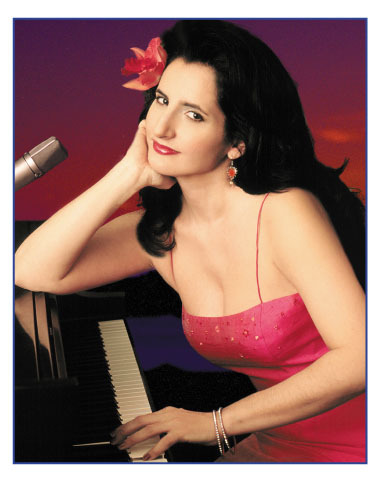 She recorded two original CDs: Unbreakable Heart with jazz legends Eddie Gomez, Lenny White, Michal Urbaniak and Toninho Horta; and of her Brazilian jazz Bring Nothing But Your Heart on Jazilian Records. The latter debuted #3 on the JazzAdds radio charts and received critical acclaim and worldwide airplay. Sue was 2nd choice worldwide in the prestigious Thelonious Monk Composition Competition and won the Billboard Composition Contest, World Category. She was a winner in JAZZIZ magazine’s Keyboards on Fire! contest judged by Dave Brubeck and Bob James, in addition to many other awards. Sue also plays violin, some bass and guitar. 13-year-old Julian Raheb is a pianist, composer, artist and a 2-time piano competition winner at the Hispanic Youth showcase at NJPAC. On April 6, 2018, he was featured on Fox 5 News by 30-time Emmy Award winning anchor Ernie Anastos, as a child prodigy. He had an interview and full page feature in The Brooklyn Paper, The Park Slope Courier, and many local newspapers. On April 8, 2018, The Regina Opera Company premiered 3 of Julian’s chamber compositions with Julian playing piano. He has been a member of the New York Philharmonic’s Very Young Composers Program since 2014. In 2016 Julian performed at Rutgers University for the 250th anniversary of the school, the 30th Anniversary of the Hispanic Youth Showcase, and the 80th anniversary of Goya Foods. In 2016 he was also invited to perform at the Newark Public Library for the 350th anniversary of the City of Newark, for the 22nd Annual Breakfast of Councilman Luis Quintana and at the Newark Club for the Annual Scholarship awards presented by the Chamber of Commerce. These events were attended by past and current Newark and other New Jersey mayors, US Senators, UN Ambassadors, members of congress and other dignitaries. Julian is also a talented visual artist and 2 time winner of the city-wide School Art Connection award and has works on display in midtown Manhattan. His poem, White Wolf, was published in the 2014, 42nd edition of Poetry In Performance. Guitarist Jeff Raheb (www.jeffraheb.com) has written over 200 works for a wide variety of instruments from solo guitar to symphony, chamber and jazz orchestras. He is a recipient of the NYFA Fellowship and has been included in the 2010 release ‘The NYFA Collection – 25 Years of New York New Music’ with his composition Zu Twa Szi for flute and guitar. His Sax Quartet No.1 was performed by the Australian Saxophone Quartet in a radio broadcast at the Sydney Opera House. In 2005 he premiered ‘Topaz under Moon’ and ‘Akita Mani Yo’ for the South Dakota Symphony Orchestra and Chamber Orchestra, with Mr. Raheb as a soloist. In 2006 The Sioux Falls Municipal band premiered ‘Makato’, for the 150th anniversary of Sioux Falls. Mr. Raheb led his jazz sextet from 1980 through 1991 (featuring among others, Mark Feldman, Ron McClure and Fred Hopkins). In 1995, Mr. Raheb co-founded a 17-piece ensemble, The Brooklyn Jazz Composers Orchestra and the Jeff Raheb Jazz Orchestra in 1998. The group featured artists such as Dave Liebman, Oliver Lake, Dean Johnson and Ron Vincent. He was a 10-year composer member of the BMI Jazz Orchestra in New York, and The Composers Big Band in New Jersey. Mr. Raheb also performs Brazilian Jazz and has had several trios, one with percussionist great, Cyro Baptista. He has produced over a dozen CD’s of guitar, jazz and classical ensemble music.